Ankle sprains may not seem like such a big deal, but in the United States, alone, an estimated 28,000 ankle injuries occur every day. Most people assume that these injuries are destined to resolve with rest, alone, and minimal self management. However, this is certainly not the case for everyone. In fact, at least one systematic review, published in the American Journal Of Medicine, reported that only 35 to 85% of sprain ankles heal in three years. Recently, there has been increasing suspicions among clinicians and researchers that the failure of some ankle sprains to fully resolve is attributable to outdated or incorrect advice given to patients and/or the general public with respect to the care and management of ankle sprains. 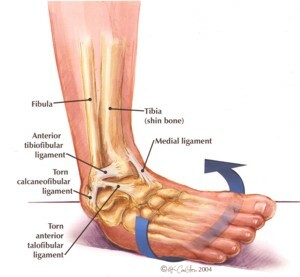 If there is a severe in-turning of the foot relative to the ankle, the forces imposed upon the ankle cause the ligaments (that hold the bones together) to stretch beyond their normal length. This is known as a ‘sprain.’ If the force is very strong, the ligaments can tear. You may lose your balance when your foot is placed unevenly on the ground. You may fall and be unable to stand on that foot. When excessive force is applied to the ankle’s soft tissue structures, you may even hear a “pop”. Pain and swelling result. A black and blue discoloration may soon also appear. The amount of force imposed upon the affected ankle ligaments determines the grade of the sprain. A mild sprain is a Grade 1. A moderate sprain is a Grade 2. A severe strain is a Grade 3. Complete tear of the ligament. If an examiner pulls or pushes on the ankle joint in certain movements, gross instability (excessive and/or inappropriate movement) occurs. The acronym ‘RICE’ appears all over the Internet and in various self-care books, pamphlets, and resources in regard to advice about ankle sprains. This acronym represents the traditional management prescription of Rest, Ice, Compression, and Elevation. The fundamental difference with these new guidelines, particularly in regard to grade 1 and grade 2 sprains, is the de-emphasis on rest. Instead, patients are advised to start moving most sprained and strain joints soon after the injury. Rest should be of limited duration and restricted to a brief window of time immediately after the inciting injury/trauma. An increasing body of scientific evidence suggests that longer periods of rest/unloading are actually harmful and produce soft tissue changes that are not optimal for the restoration of full strength and desired biomechanics. Of course, no one is suggesting that people be forced to walk or certainly run on their sprained ankles right away. But some randomized controlled trials have shown that beginning range of motion exercises within a couple of days, followed by gradually increased loading, can get patients back on their feet more quickly. Joint manipulation by trained health care providers has also shown success in these trials. 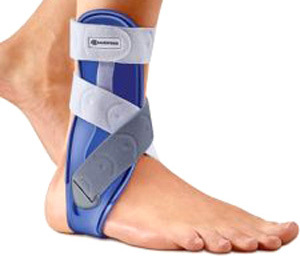 For grade 3 ankle sprains (complete ligament tear), a study published by the National Athletic Trainers Association advises initial immobilization of the joint for 10 days. After that, they recommend that patients should begin moving the injured joint. Braces and supports, like the type shown here, can provide protection that can enable an early return to weight bearing and walking, as well as protecting the joint from unexpected/undesired movements, or losses of balance. The use of canes, crutches, and walkers can reduce effective body weight. This can help provide optimum loading so that an early return to walking and standing can be achieved more comfortably and to make sure that the load bearing capabilities of the injured ankle are not exceeded so that healing can progress. The use of ice, cold packs, or cold water immersion can reduce the sensation of pain for many people and can also help control swelling. Cold application should not be prolonged in order to prevent thermal injury or vascular responses that are counter to the intended purpose of cold application. The use of wraps, tape, or various bandages can provide compression that can reduce the leaking of fluids from capillaries into tissue spaces. This can also help reduce swelling. Elevation of the legs can keep blood from pooling in the injured foot/ankle. This, too, can help reduce or control swelling. There remains a general consensus among clinicians and researchers that extreme swelling adds days, if not weeks, to the healing process. The general belief remains that if one can control swelling, a faster return to sports or normal activities will transpire. As a side note, an emerging controversy over the use of Non-steroidal Ant-inflammatory Drugs (NSAIDS), such as the one shown above, is worth mentioning. Some researchers point out benefits to injured body parts that occur during the initial stages of inflammation. 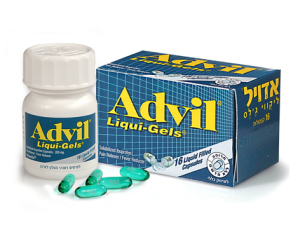 NSAIDs, some believe, might interfere with those benefits. As a result, there are some clinicians and researchers that now recommend that NSAIDs not be consumed during the first 48 hours after injury. Disclaimer: The images, text, video, or other media displayed above are intended for informational purposes only and are not considered specific medical or chiropractic advice. Transmission of this information is not intended to create, and receipt does not constitute, any form of doctor-patient relationship. Internet subscribers and online readers should not act upon this information without seeking their own professional consultation. The information contained in this web site is provided only as general information, which may or may not reflect the most current health care/scientific developments. This information is not provided in the course of a doctor-patient relationship and is not intended to constitute medical or chiropractic advice or to substitute for obtaining health care advice from a duly licensed health care provider in your state.